Heat the oven up to 200 degrees and, in slightly salted water, boil the Cellentani for 4 minutes. Drain and put a few spoons of olive oil (optional). Mix the cheese (leave 1/2 cup of it aside) and the cream, and heat them on the hob until the cheese melts. Season with salt and pepper. 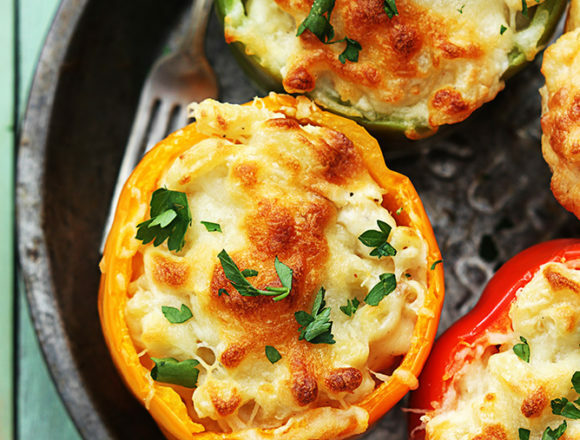 Remove the seeds and handles of the peppers, fill them with the mixture and sprinkle the remaining cheese on top. Put them in the oven for 10-15 minutes.Before serving, sprinkle with a little parsley.